Hope to find treasure hiding in the rainforests of Indonesia in Divine Dreams, a 5 reel, 243 ways to win video slot from Quickspin. Central to the action here is the Bonus Wheel that can produce multipliers and respins with added wilds and even bigger multipliers. There’s also a free spins round. Play this volatile offering on your PC, tablet or mobile from between 20p and £100 per spin. Quickspin is in the Premier League when it comes to the design of their video slots and Divine Dreams is another cracking looking game. The setting is a tropical forest. Joining the lower value rune-style symbols are higher value animal statues. The most lucrative of these is the elephant. Land 3, 4 or 5 of these on adjacent reels and you’ll pocket an award of 1, 2.5 or 15 times your total bet. There’s also a wild that replaces everything bar the scatter. Mystical Multipliers feature – this become active with every winning spin. The multiplier from the Bonus Wheel, up to 10x, is then applied to your win from the main set of reels. Yin Yang Wilds – land this symbol on the Bonus Wheel and you’ll see 2 extra wilds added to reels. Any win there is also boosted by a random multiplier (up to 10x). Sacred Respin feature – a respin is awarded if you land the Super Respin symbol on the Bonus Wheel. On that extra spin, you’ll see added wilds and upgraded multiplier values up to 20x. You’ll also have a shot at triggering the Mega Respin feature. Mega Respin feature – you can land this directly from the Bonus Wheel or via the Sacred Respin feature. Once again 1 respin is awarded with extra wilds. The multipliers increase still further here and can reach a whopping 30x. Land 3, 4 or 5 goddess scatters and you’ll trigger the Divine Free Spins feature – on offer are 8, 12 or 20 free spins. Those free spins come with extra wilds. You can expect to trigger the respins and Yin Yang wilds more often than in the base game. Land a +3 on the Bonus Wheel and 3 more free spins are added to your tally. You can also benefit from increased multipliers up to 30x! 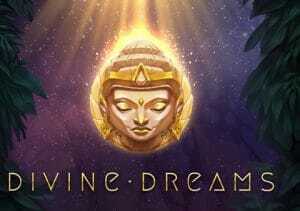 At first glance, Divine Dreams looks like a very gentle video slot. Don’t be fooled by the soothing visuals and tranquil backing track though. This is a high variance game and you can expect some big swings. The super high volatility might not be for everyone but it can pay out a mind-blowing 7,414.9 times your total bet on each spin/respin/free spin! The sound and visuals are top notch and the variety of extras impresses. If you can’t get enough volatile action, then Divine Dreams should catch your interest. Quickspin create great video slots with Tiger’s Glory and Ark of Mystery worth trying.